Boston Marathon weekend in the city is filled with energy and pride and there’s a lot happening all around town. This guide is filled with special deals, discounts, specialties, where to eat and drink, street closings and volunteer opportunities in the neighborhood! Whether you’re running the Marathon or just cheering for someone running it, you can carbo-load your way around Southie this week! Babbo will be hosting a Pre-Marathon Pasta Party on Thursday, April 12th at 6:30 p.m. The seated dinner will cost $60 per person and will include wine paired with each course (YES)! Oak & Rowan in Fort Point want to keep your energy up on Sunday, April 15th with a special brunch featuring egg sandwiches and dutch babies. They will also opening again for a special Sunday Supper, with pasta specials like garganelle bolognese and lemon-ricotta ravioli. Yum! Row 34 will be getting in on the carbo-loading-palooza. On April 15th from 5:00-10:00 p.m., enjoy three different pasta options like kale bucatini with clams, green garlic and pistachio or garganelli with tuna bolognese and pecorino. Shakeout run! Lulu Lemon in the Seaport and Ciele Athletics are hosting a pre-race fun run on Saturday at 3 p.m.! Participate in the Shakeout run and an after party featuring Mystic Brewery and appetizers by Tuscan Kitchen. You can register for it here! Pray for us runners! Our Lady of Good Voyage/Seaport Shrine is hosting a special mass for all the participants of the Boston Marathon on Sunday, April 15th at 7pm with a special blessing for the runners! If wading through the throngs of marathon on-lookers in the Back Bay isn’t how you’re looking to spend your Patriots Day, Kings Seaport offers an escape away from the crowds. Perfect for marathon viewing, Kings’ new Seaport location’s revamped bar and modern gastro-sports pub concept, The Draft Room, features three impressive stadium quality 12-foot HD LED screens, multiple HDTVs, over 40 beers on tap, and a 160-person capacity. It’s 100% made-from-scratch menu features pizzas, burgers, wings, nachos, giant beer mugs, and shareable, large-format drinks. Kings,Seaport will also be serving up Sam Adams’ 26.2 on tap. 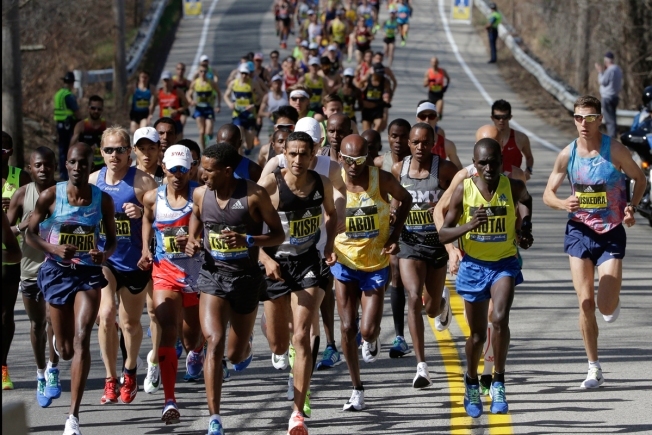 Celebrate the Boston Marathon at the Outlook Kitchen & Bar at The Envoy Hotel! Order up the specialty cocktail “The Finish Line” and enjoy the views! Give those feet a little TLC at MiniLuxe in the Seaport! Show your bib and enjoy a complimentary deluxe massage with any pedicure service. by CHLOE is offering 25% off your meal if you show your registration! On Marathon Monday runners get a free pasta with their medal. Empire Restaurant & Lounge Enjoy an exclusive Marathon menu and complimentary appetizer for all Marathon runners with your 2018 race bib. Pitch in on One Boston Day with MR8! One Boston Day is fast approaching and The Martin Richard Foundation will host a community Day of Service that includes a dozen service projects throughout Dorchester and a Service Village at Town Field. A moment of silence will be held at Town Field at 2:49 p.m. We would love more of our neighbors to come join us to volunteer. For more information, visit here! Head to Shake Shack and enjoy a Boston Marathon Exclusive Team MR8 Shake Monday April 9th – Monday, April 16th for $5.99. This shake is made with vanilla custard blended with fudge sauce and peanut butter sauce topped with whipped cream and chocolate sprinkles! 100% off the proceeds goes to MR8! Lucy’s American Tavern is featuring three specialty cocktails made with Bully Boy like MR8 Lemonade, Scream Tunnel Tea, and the 26.2 Gin+Juice through Marathon Monday. 100% of the proceeds will go to the Martin Richard Foundation! We’ll drink to that! Boloco will be donating $0.08 from every burrito or bowl sold on One Boston Day (April 15th) to the Martin Richard Foundation! Perfect excuse to eat a burrito! Head to Southie for some shopping! Habit and Wears + Wares will be donating 10% off all sales from Friday to Monday to MR8! You can update your closet with some spring fashion for a great cause! If you would like to learn more about the Martin Richard Foundation visit here! The post Guide to the Boston Marathon appeared first on Caught In Southie.